If there is one thing my kids get excited for each holiday, it is layered Jello. This fun and easy to make Jello looks impressive and my kids LOVE separating each layer and eating it. It is delicious and while it does take a little bit of time because each layer needs to set up, it couldn’t be easier to make. 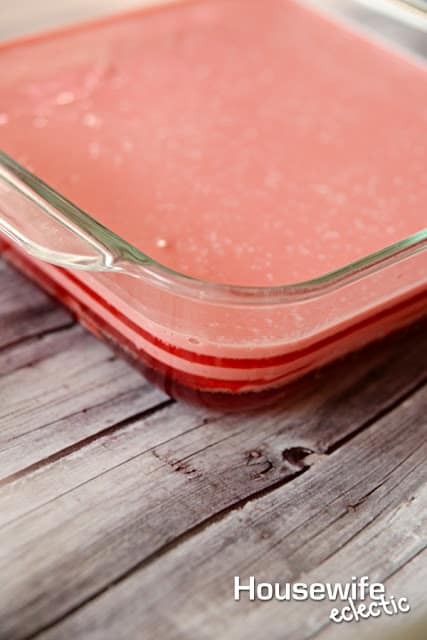 Dissolve your first box of Jello in 1 cup of boiling water. Separate the Jello in half, into two bowls. Add two tablespoons of cold water to one and then put that bowl of Jello that you added the water to, into a clear 8×8 pan. Place the pan flat in the fridge and allow to set for 30 minutes. After 20 minutes, add 1/3 of a cup of sour cream to the other bowl of Jello that has been sitting on your counter. Mix until well combined. I use a whisk to get it really well mixed. After the 30 minutes have passed and the Jello in the fridge has set up, pull the pan of Jello out and pout the bowl of Jello with the sour cream in it over top the set Jello. Place back in the fridge for 30 minutes. Repeat until you have all 6 layers. When you have all of your layers, add a dollop of whipped cream on top of each slice. You can make it with as many or as few layers as you want. I think it looks best with 6-10 layers. Make sure the pan is as flat as possible when you put it in the fridge so your layers don’t end up crooked. This Jello recipe does take a few hours to put together, but I just do it on a day I plan to be home and then it is pretty darn simple! This. Looks. So. Good. I have to try this! Both my hubby and my son are HUGE fans of Jello so I know that this will soon be a family favourite. I have never had the patience before to try and make my jello layered but it looks so pretty!! 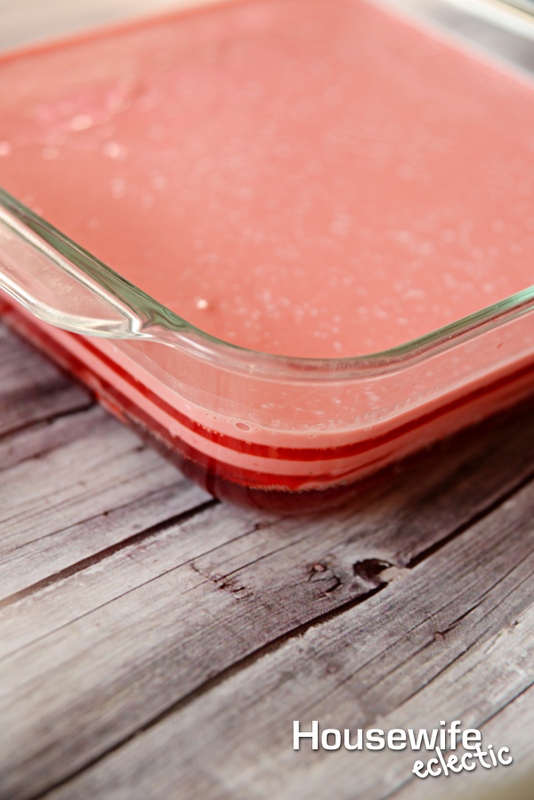 I haven't had jello since I was a kid, and certainly not layered jello…looks good! I don't like jello BUT I love the look of layered Jello!! Jett would love this! Never would've guessed sour cream is in this recipe. Looks fun and I bet my boys would gobble it up! Love jello and jello dishes! It also looks beautiful! Smashing recipe! Such great imagery too! Great work! Gosh, I just want to make this now. It looks delicious! I love seeing these layered Jell-o looks as it is so fun to make them with varying colors to match whatever occasion you are celebrating – looks great! 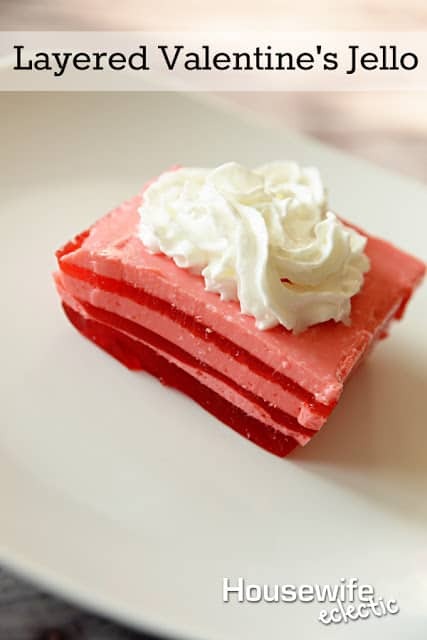 This looks fantastic, my Hubby would love this jello, not only for V day! This looks amazing I have never thought of layering jelly before. Then again most jellies are not vegetarian so I guess that might be why! This is so cute! I feel like layering jello is something you could do for any even just change the color! Our lil man LOVES jello but I have never made it layered for him. I think he would totally love this!! Growing up jello was my favorite dessert!! My how does times change!!! Haaaa!!! That looks so good. The girls will be thrilled to see the layered jello. My mom makes something similar to this, it was a favorite growing up! I will have to try this though, my kids would love the layers! That is so cute! Super easy looking too! I'm not a huge fan of jello, but my kids sue are! :) I think I know what treat I will make them this year. I haven't had Jello in so long, nor have I made any special dessert with it before. This looks tasty, and I like the layered look. This is pretty festive and definitely easy to make! It would make a great dish to take to a school party. 🙂 Thanks for sharing the directions!